Gregory Rusedski (born 6 September 1973) is a retired Canadian-British tennis player. 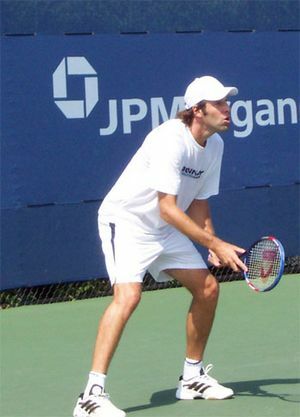 Rusedski was born in Montreal, Quebec, Canada. His mother is English. His father was born in Germany and was of Polish and Ukrainian descent. Rusedski turned pro in 1991 and played for Canada until 1995. From 1995 until his retirement in 2007, he played for Great Britain. He was the losing finalist in the 1997 U.S. Open. His world ranking peaked at no.4 later that year. He was the British number 1 in 1997 and 1999. He competed in the 1996 and 2000 Summer Olympics. Rusedski was a contestant on Dancing on Ice in 2008. He lives in London. Greg Rusedski Facts for Kids. Kiddle Encyclopedia.